decorated in repoussé technique with a pair of fenghuang birds with long scrolling tail feathers filling a medallion on the platform top, the mythical crested birds shown with wings displayed as if in flight, spiraling on opposite sides of a leafy peony sprig held in their beaks, all in varied high relief above a textured ground and with finely incised details, the medallion enclosed by a raised line border and encircled by a chased band of composite flower scroll with numerous different flowers and buds shown on continuous leafy stems drawn in outline on textured grounds within an outer border of hexafoil bracket-lobed outline, the sides rounded out to a shallow step and continuing down to a flat projecting frieze of conforming shape, chased with a repeating design of long spiky leaves on an undulating vine, all in outline on a textured ground, the lower half of the box of approximately equal depth, shaped and decorated to match, the flat base raised on a simple ring foot, the metal with lightly tarnished surface and showing traces of earth from burial. 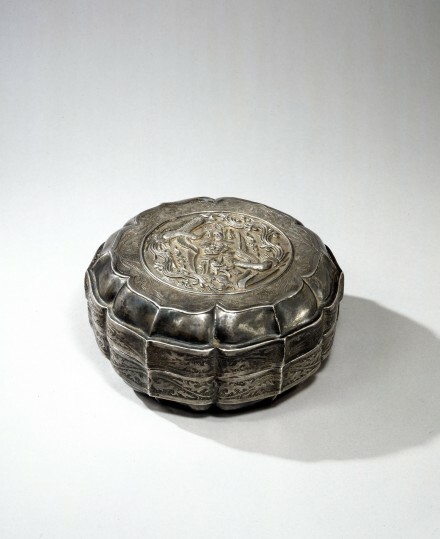 Song silver boxes of related form and design, discovered in 1959 in a hoard which was buried at temple site in Deyang county, Sichuan province, have been published in a report entitled Sichuan Deyang Chutu Song Dai Yinqi Jianjie (A Discussion of Song Dynasty Silver Excavated at Deyang Sichuan) in Wenwu, 1961, No. 11, pp. 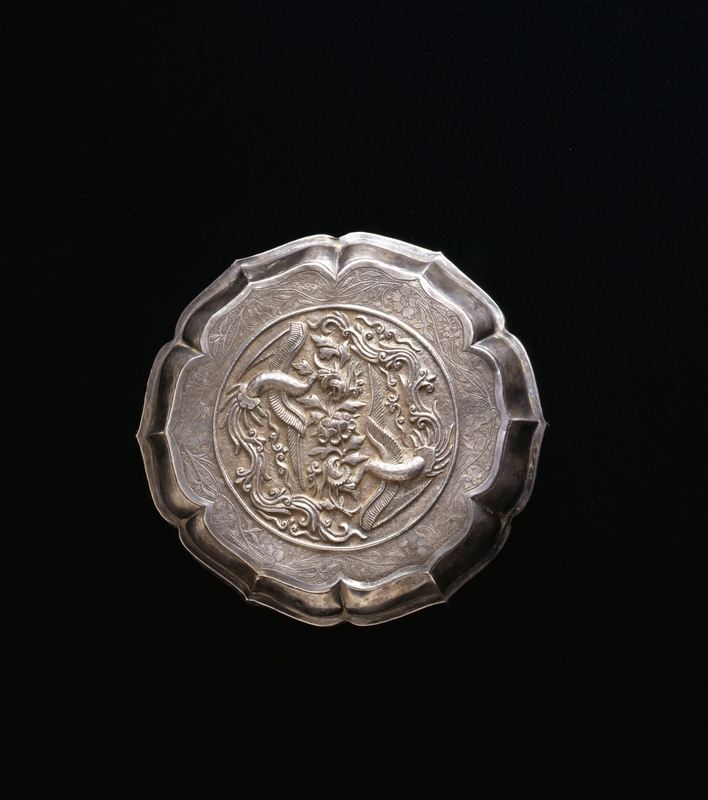 48-52, including a small silver box decorated with twin phoenix flanking a blossoming peony sprig in a medallion which is very similar to the present example, illustrated in detailed line drawings on p. 52, no. 16. Compare also the larger boxes from the same hoard which are similar in form and show closely related decorative motifs executed in the same techniques, including an eight-lobed circular box, op. cit. no. 11, and a thirty-two lobed circular box, op. cit. no 13. The same thirty-two lobed box is illustrated in Zhongguo Meishu Quanji (The Great Treasury of Chinese Fine Arts), Vol. 10: Gongyi Meishu Bian (Works of Art and Craft), Beijing, 1987, p.48, col.pl. 101, with full description on p. 29.